A new title from NTT Solmare’s “Shall we date?” series, “Shall we date? : Seasons of love -Scarlet Fate II-” is now out! 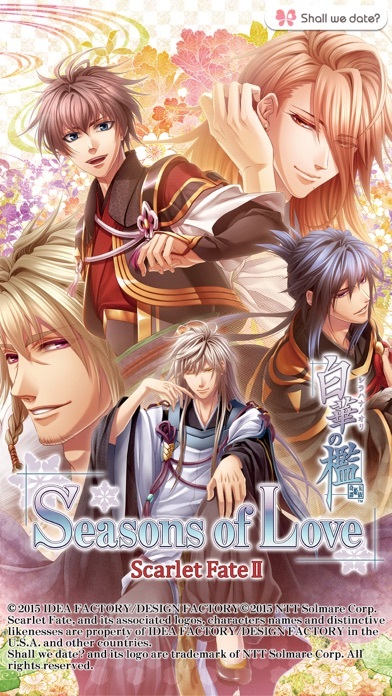 Seasons of love -Scarlet Fate II- (original title Shirahana no Ori -Hiiro no Kakera 4- Shiki no Uta) is a sequel to “Scarlet Fate -Fragments of the past-”, one of the many successful romance visual novel games from the famous “Otomate” brand from Idea Factory known for critically acclaimed titles such as “Hakuoki”, “Demons’ Bond” and “Amnesia.” With its story beautifully rendered in all four seasons of ancient Japan, “Shall we date? : Seasons of love -Scarlet Fate II-” will impress all romance visual novel lovers! 1.Story Introduction Song of Spring: This is the sequel to “Scarlet Fate”. Blooming in the warmth of spring, the heroine and each of her five comrades, men who fought to free her from her fate, can now be couples in these individual stories. Enjoy the days filled with happiness and love which finally come after overcoming the harsh winter season! 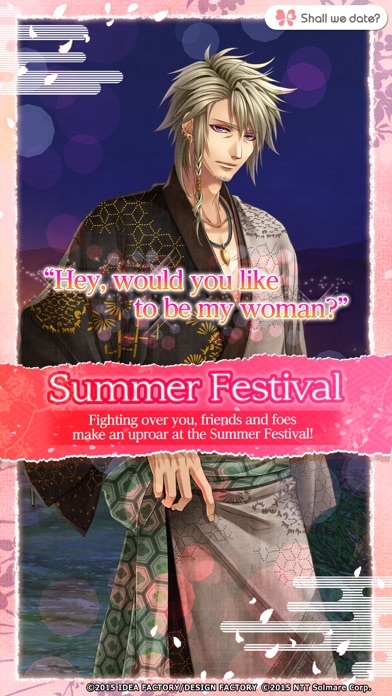 Summer Festival: In Kifu village, the heroine and her five comrades decide to carry out the Summer Festival. With other special guests joining in the festival, they make uproar, fighting over her, creating a lively summer night scene. It is a story full of passion and humor, and a player will find “him” even more attractive in a Yukata, summer kimono. Autumn Harvest: A collection of short stories about daily life of the heroine and her comrades. There are five themes: “Sleeping Together”, “Meal Together”, “Squabble”, “Holiday Afternoon” and “Secret Meeting”, each having two versions: “Lovers” and “Princess & Knight”. The player will see unexpected sides of them and will have a chance to get special photos. Winter Snowflakes: Untold stories of “Scarlet Fate -Fragments of the past-”. Akifusa’s best friend Tomonori and Gentoka’s sworn friend Aterui are now main characters. Tormented in their position, they waver, yet fight for the heroine to be released from their fate. Reading these hidden stories will help the player understand the world of “Scarlet Fate” even deeper. 2.FEATURES 1) Stories beautifully rendered in all four seasons of ancient Japan, gorgeous photos and exquisite background music. 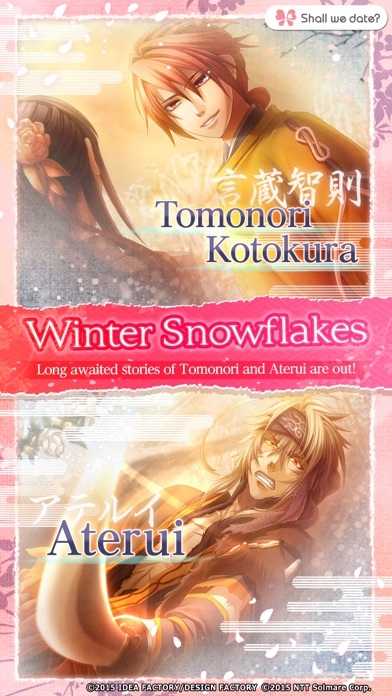 2) Together with the stories of the five comrades from “Scarlet Fate”, other stories of Tomonori and Aterui begin in the “Winter Snowflake”. 3) Enemies from “Scarlet Fate” appear in an unexpected way in the “Summer Festival”, showing other sides of them. 4) We offer a special price for the set of multiple stories, or regular price for a single story. 3.FOLLOW US facebook.com/ShallWeDate.NTTSolmare (Don’t forget to LIKE us if you enjoy our game!) youtube.com/user/ShallWeDate 4.ABOUT US Thank you very much for your interests and downloads of our games! NTT Solmare is a game company especially focusing to bring Japanese visual novels and Otome games to the world! Seasons of love -Scarlet FateII- is one of our game series, “Shall we date?”. We sincerely hope enjoying our games and give us feedback!